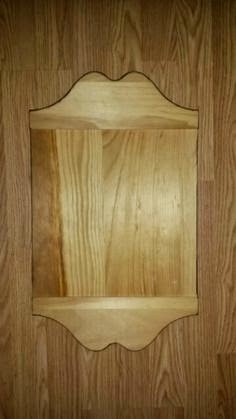 Here's a plain old board that I picked up at a yard sale for only a quarter. Being plain wood, I knew I could make it into something cute for my Booth #555 . And here's what I came up with. First, I painted it in two cute colors, maroon and black, both flat. Really simple and one coat of paint did the trick. Then I rounded up a cute stencil that I keep a stack of in a cardboard box. They are really endless in life, as long as you wash them up a bit after each use. Here's the one I picked out. 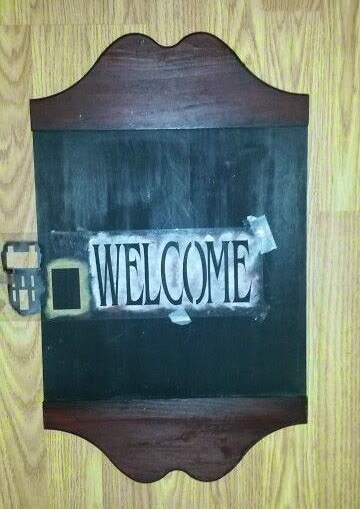 It was a simple "Welcome" wording with a house also on it. 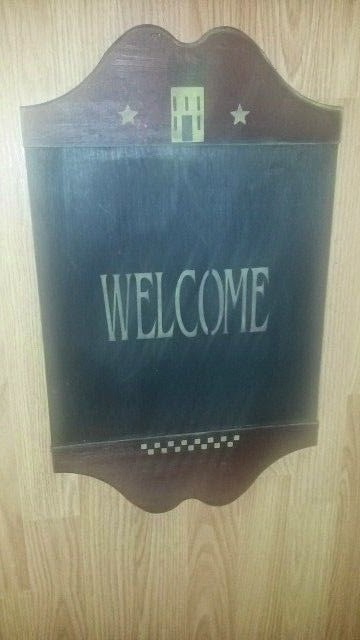 I thought it would fit perfectly as a welcome sign outside of someone's front door. Here it is all stenciled on. 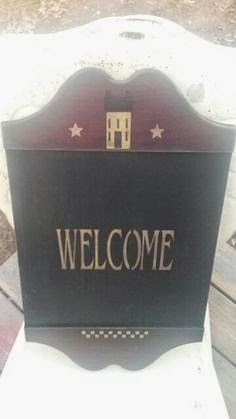 I used an off white mixed with a touch of yellow for the word WELCOME and the house and stars. I also run a line of checkerboard pattern along the bottom to add a little something. I think it turned out okay just for a 25cent piece of wood that I found. What about you? Very cute and creative!!! Can't believe something so adorable came from just some simple wood! Idk if you've mentioned this before, but where did you get your stencils from? Hi Michelle and thank you so much! Most all of my stencils come from eBay. I look in the buy it nows. Sometimes you can find "lots" that have a few different types in one buy it now auction. And cheap! Even the ones that have been previously used are good for a long time still. thanks again for your comment! I appreciate it! You're very welcome! And thanks for the response! I'll have to look into eBay!!! Where I first rented a space to sell my crafts in my little Booth # 555. WHEN IS PRESTON COURT DAYS 2018? 2010 - 2017. Please do not alter photos or text. Photos belong to the blog author. If you use snippets of this blog on your blog, please provide a valid hyperlink to www.booth555.com with appropriate and specific direction to the original content you shared. Feel free to share content on Pinterest. Thank you much! Copyright 2010 - 2018. Powered by Blogger.